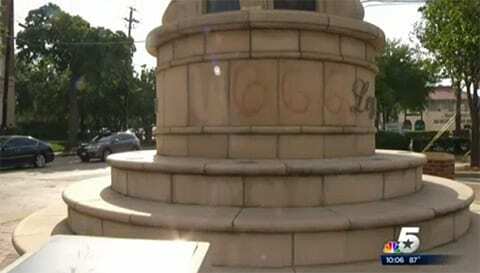 A monument in Oak Lawn, Dallas, which has become a gathering place for LGBT rallies, protests, and vigils, has been defaced with the tag “666” in red paint. Named for an endowment started by Dallas resident Donna Fishel, the 35-foot Legacy of Love monument includes plaques inscribed for people who supported its building, were historically significant in the neighborhood or died of AIDS. Fishel and others had donated money on behalf of Friedhelm Schnitzler and Heinz Reifferscheid, partners for more than 25 years both of whom died of AIDS. Along with the Legacy Of Love monument, the Cathedral of Hope which has a large lesbian and gay membership, and the buildings that house the Dallas Observer, were also targeted with the same graffiti. 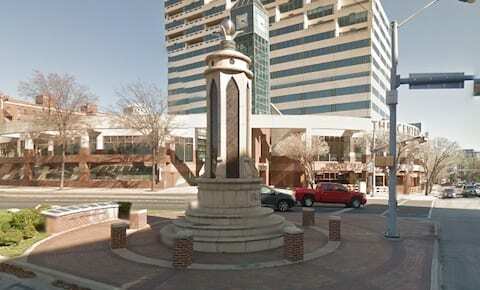 Marks, who along with other volunteers spent Sunday afternoon cleaning the monument, said they may have the monument sandblasted if the paint fails to come off.